First off - let me remind any of you local folks but the Webs Tent Sale is this coming Saturday and Sunday. I will be having a booth on Saturday at the "Fleece Sale" from 10 to 5. I will be selling our Leyden Glen Lamb and some other goodies if I can get myself organized. Here is their site for more info. Back to my Sunflower Pillow project. The last sunflower I stitched was inspired by the maturing sunflower blooms. 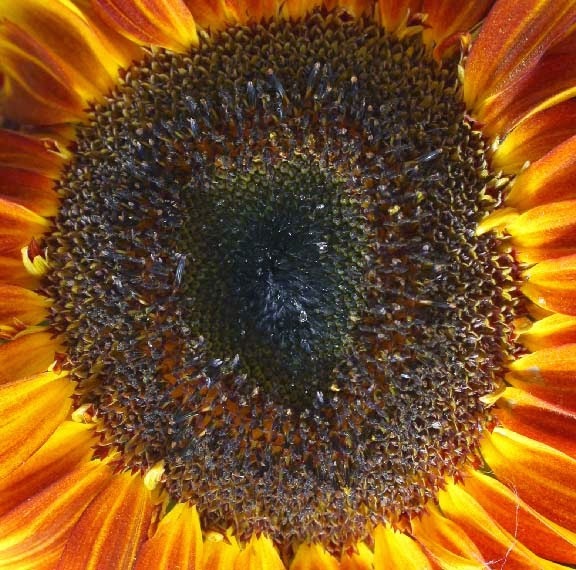 As sunflowers bloom and age, their outer rings become more textured. This is a Stella Gold Sunflower - another favorite variety of mine. You can see its outer ring has lots of texture. Here is another sunflower - variety unknown - with its center beginning to take on a rounded and textured appearance. This is the largest sunflower in the pillow design. It took a lot of stitching but it was fun to make over the days I was selling at the Farmers Market. 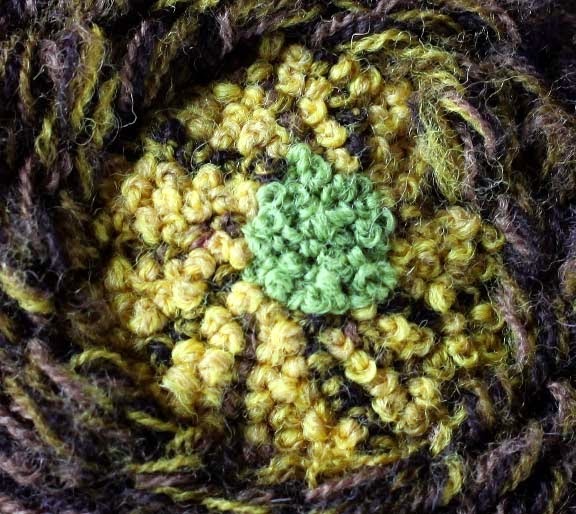 The outside petals were stitched in stem stitch packed tightly together. I used Turkeywork to give the texture to my outer ring of my third sunflower. I didn't cut the Turkeywork - just left it looped. Here is a detail, showing a side view of the looped Turkeywork. 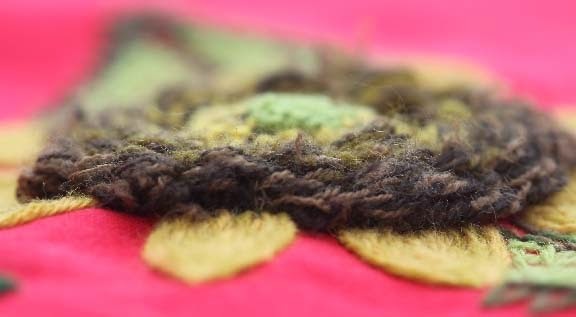 As you can see, I used two different shades of brown in the needle at the same time to give a multi-color look. Towards the center, I changed the colors a bit. Turkeywork takes a lot of thread. For the center of the sunflower I used French knots. I used multiple strands to get larger knots. 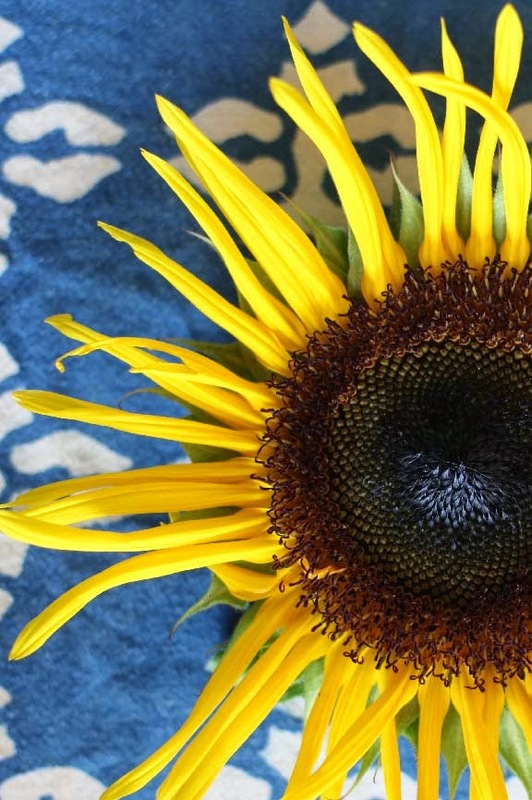 I built a swirly pattern with the darker brown to mimic the natural pattern of the center of a sunflower. Then I filled it in with a gold color. At the very center, I used a light green color. For the leaves, I decided to let the fabric show through to give a little extra visual texture. I used random cross stitch. To create the jagged edge, I used fly stitch. 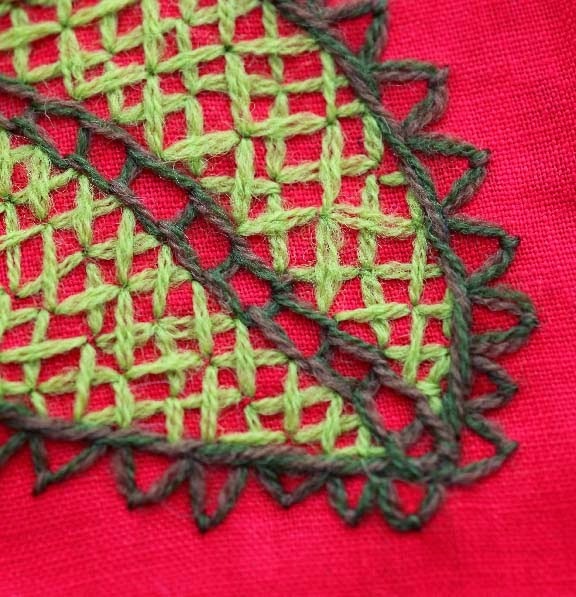 The center vein was created with open chain stitch. I haven't done crewel for a million years, but uou make it look fresh and appealing again. Your embroidery is gorgeous. Please fix the link. It takes me to a page within your blog which doesn't exist - not to Craftsy. Link fixed. Thx for letting me know. I'm really enjoying your Color by Kristin. So many people don't take the time to actually READ knitting books, but I am very much enjoying reading yours. Please take me up on my offer to help you out if you ever need a knitter or stitcher. You can find me on Ravelry at "saralouise" or e-mail me. Kristin, I received Rebecca's book and I thank you so much. I remember Susan Anderson talking about taking her workshop on her blog and how much she enjoyed it and here I have it in book form and it even comes with a sampler to work! 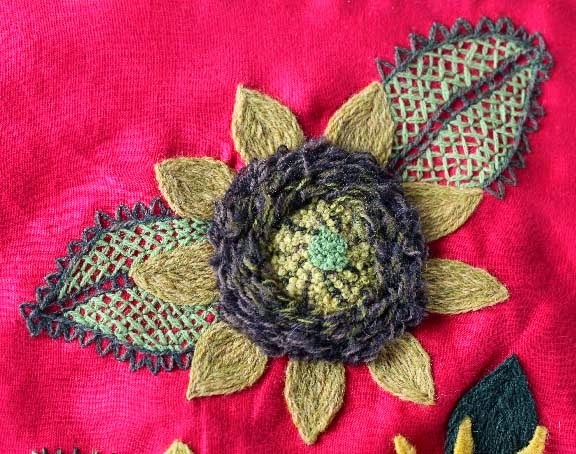 I adore you sunflower and it's really been years since I embroidered or did crewel work but now that I am retired there are not enough hours in the day! LOL! I love it all and I'm thinking of signing up for your class too. I wish I would have retired years ago! Ha! Ha! Thank you for your blog too.